Monomodal suspensions with the nominal particle diameters: 170 nm, 250 nm, 550 nm and 1000 nm are available. There are monomodal suspensions with the nominal particle diameters: 15μm, 20μm, 29μm and 38μm available. 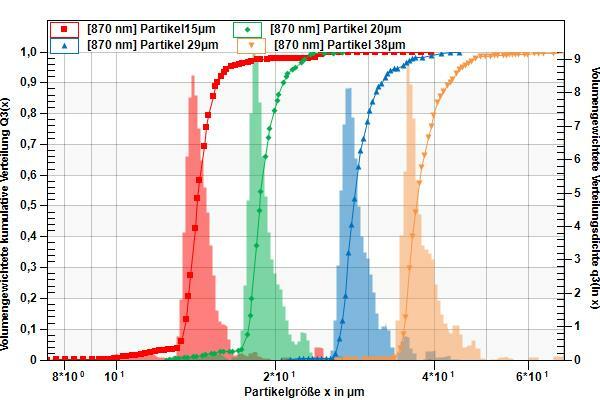 The monomodal particle suspensions can be used advantageously for validation and qualification of high resolution particle sizers such as e.g. LUMiFuge®, LUMiSizer® or LUMiReader®-PSA (LUM GmbH). They cover a wide particle size range and, due to their defined size grading and particle size distribution, allow the user to test resolution and accuracy of the analytical method. Of course, SediTest™ is also suitable for use in other devices. 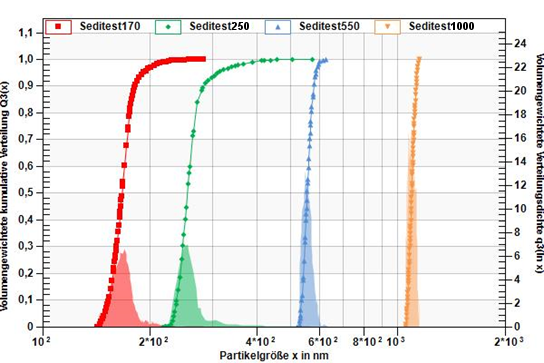 The use of SediTest™ with LUMiSizer® or LUMiReader®-PSA doesn'nt require special sample preparation; the suspension only needs to be briefly redispersed. All required information can be found in the enclosed instructions for use. SediTest™-Particle suspensions are supplied with a particle size certificate. Do you have questions about SediTest™ or would you like to order? Please contact us.